You might find it hard to be impressed with a SATA based SSD in a world where PCIe SSDs exist, but despite their speed-capped interface, companies like Crucial continue to optimize, and use new tricks, to eke as much performance as possible out of those flash chips. The BX300 is a great example of where we stand today. Solid-states drives are nothing new; Crucial (the consumer-focused brand of Micron Technology) has been making them for a full decade. While exotic interfaces and elaborate PCIe card solutions have come and gone over the years, the one constant has always been the SATA 6Gbps interface. Since Crucial introduced its first SATA 6Gb C300 SSD nine years ago, the SATA interface hasn’t really changed all that much. Faster interfaces like M.2 exist today, but even so, SATA 6Gb SSD’s continue to offer a measurable, significant performance upgrade over spinning mechanical drives that must be felt to be believed. With NAND prices staying steady consumers can readily save a few bucks (or quid) by sticking to SATA based SSDs, yet still enjoy most of the benefits flash based drives have to offer. That brings us to the BX300 SSD. 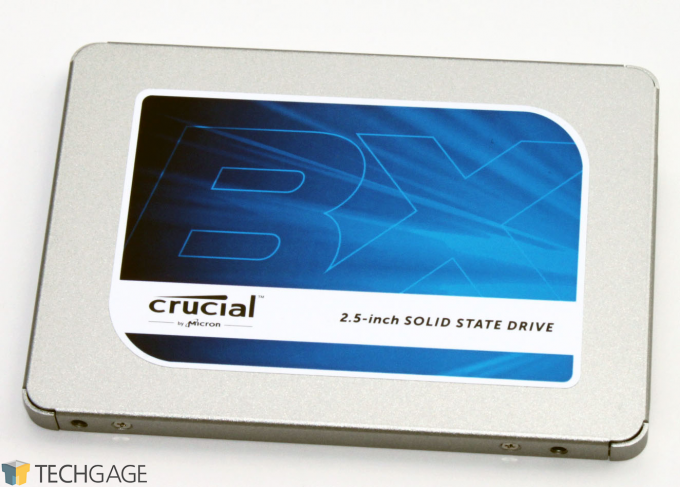 The BX300 is Crucial’s latest budget-focused solid-state drive using the updated Silicon Motion SM2258 controller. It is worth noting that while the previous BX200 drives utilized 128Gbit TLC NAND, the BX300 series reverts back to MLC with Micron’s latest 256Gbit 3D MLC NAND. This automatically gives the BX300 a leg up over its predecessor in both performance and endurance and makes it much better suited than the BX200 for sustained workloads. When shopping for budget SSDs, the quickest way to differentiate between drives is to check if a DRAM cache is included for reliable performance. Naturally the BX300 features a 256MB or 512MB cache depending on model capacity. The second trick budget SSDs have been doing for a few years is “set” or dedicate a small portion of the NAND flash to operate as a faster SLC write cache. SLC stores a single bit per cell, offering significantly faster writes and longer endurance over MLC or TLC flash. This allows SATA drives to offer higher performance levels perfectly suitable for most consumer needs, but does have the secondary effect of boosting short, small drive benchmarks that are small enough to fit neatly within the SLC cache. Interestingly, Crucial has made its SLC cache size information readily available. The dedicated SLC cache size doubles at each capacity level, meaning 240GB and 480GB drives will benefit the most from the larger cache and therefore offer more consistent performance. It is worth reiterating SSD controllers rely on reading & writing to multiple flash chips concurrently to increase performance, so it should come as no surprise the 120GB drive is only rated to offer half of the random read IOPS of its larger siblings. So despite the 120GB’s lower price, consumers will see multiple performance benefits to spending a little more for the 240GB model. Larger capacities also have the side benefit of allowing additional spare area for wear-leveling, which improves overall drive endurance by keeping the wear amplification lower. For this review we will be including the Micron C400, aka the Crucial m4 we reviewed a little over six years ago just to have an interesting comparison point against “modern” SSDs on the market today. The SATA 6Gb’s interface hasn’t changed an iota but even a budget SSD like the BX200 should have no trouble against a flagship model predecessor. 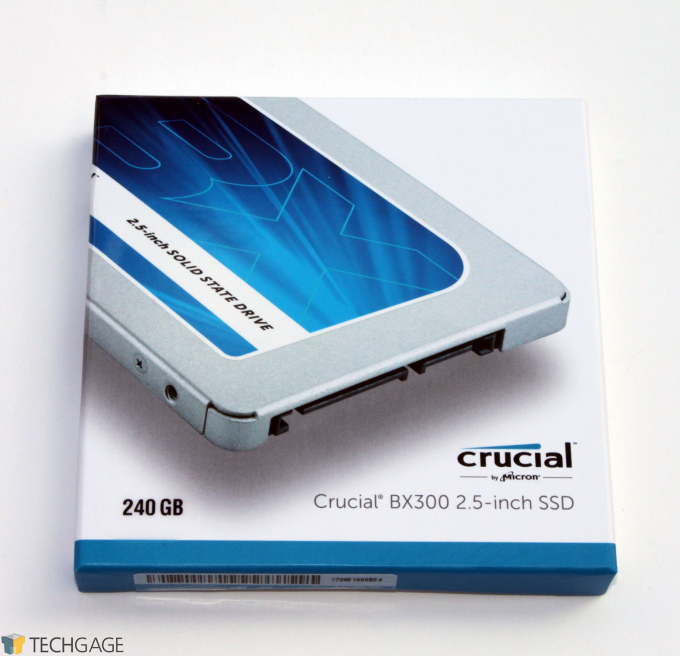 Crucial offers a rather expansive software suite for its SSDs known as “Storage Executive“. This toolkit can display serial numbers, health, and other information even for competitors SSDs as well as the usual firmware updates, health check, and SMART data for Crucial drives. Some extra features supported by the BX300 is the “Sanitize” option which effectively performs a Secure Erase. For SSDs that support hardware drive encryption “PSID Revert” is the method one would use to nuke the encryption key to recover access to the drive, naturally at the expense of all encrypted data being lost. However the BX300 Series lacks hardware encryption, making this moot. Momentum Cache simply creates a buffer in the system RAM for better performance consistency, but is not recommended as a power failure, BSOD, or unexpected restart will result in the cached data being lost. Last up Over-Provisioning is an interesting option not offered by most SSD manufacturers, and allows the user to increase the default over-provisioning area of the SSD. Increasing it can improve performance consistency, decrease the write amplification, and even increase the overall endurance lifespan of the SSD. The drawback is that any additional space dedicated toward over-provisioning can no longer be seen nor used by the system itself, exactly the same as with the over-provisioned area all SSDs ship with by default. Consumers interested in learning more about these features can peruse through the Storage Executive user guide. To ensure all drives have fair representation regardless of capacity in our testing, we use IOMeter to conduct continuous file writes beyond twice the rated capacity of each SSD. This will make sure every block has been written to at least once, including the unaddressable spare area present on all solid-state drives, ensuring all drives begin testing in a normalized “dirty” state. SATA drives are tested on an Intel 6Gbps SATA port, while PCIe cards will use the PCIe Gen 3 x8 slot to the processor. M.2 drives will make use of a NVMe compatible PCIe adapter card in this same slot to bypass the M.2 x2 interface bottleneck (some motherboards only offer an x2 lane M.2 port), allowing drives to utilize the maximum bandwidth (PCIe Gen 3 x4) that the M.2 interface supports. Where applicable, we will ensure M.2 drives are using the NVM Express protocol. The test system’s processor has had Intel’s Speedstep and Turbo Boost functionality disabled and all cores are locked to the same 3.7GHz frequency in order to ensure maximum consistency between test runs.